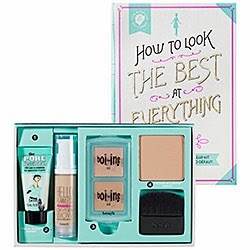 I've recently become a fan of Benefit cosmetics - I always thought their packaging was cute, but that isn't good enough reason to upgrade from drugstore makeup. However, after getting some free samples from Ulta, I realized I liked their product formulations on their own merit. 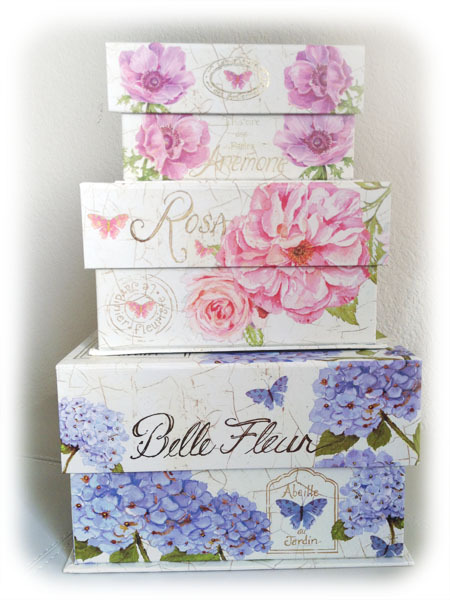 So far, I've only purchased kits, which are generally a great deal products-wise, and have additional cute tin/box packaging. While calculating the value of these kits, I realized something odd - namely, that some of the deluxe sample sizes sold by Benefit are a better deal than buying the full sizes. All the deluxe sample sizes sold by Benefit are $8/ea (with the exception of They're Real, which is currently available in both $10 and $8 deluxe sample sizes, but the $8 size is relatively new, so I have a feeling the $10 will be phased out). The better deal is shown in green, and products are arranged in order of "buy full size" to "buy sample size" (based on % discount buying one size or the other). Of course, there are plenty other reasons to buy a larger/smaller size, and the Creaseless Cream Shadow deluxe sample only comes in one color. Personally, I'm a fan of small sizes because I tend to change my makeup routine and rarely use up full sizes of anything other than foundation. *Buy either the jumbo 44 mL size or the sample 7.5 mL size - either is a better deal than the standard "full size." 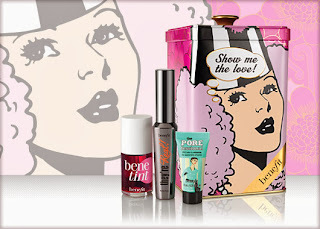 Unfortunately, as far as I know the deluxe sample sizes are only available for purchase directly from Benefit - if I could buy them at my local Sephora/ULTA, I'd definitely pick up deluxe samples of the Sugarbomb face powder and the Creaseless Cream Shadow. If I'm going to pay $5.95 for shipping (or spend $50 to get free shipping), I'll buy from Sephora or ULTA and get some rewards points/GWPs. Over the course of the last year, my clothing size changed, as did my style, leaving me with a ton of clothes I no longer wore. So my first project of the summer was cleaning out my closet - and of course, adding a few new items. In the past I've always just donated old clothes, but this time I felt like I had a lot of clothes I couldn't bear to just let go, so I wanted to try selling them. I don't have the patience to sell small-ticket items one by one on eBay, and secondhand stores like Buffalo Exchange look mostly for trendy, in-season items, so those options were out. 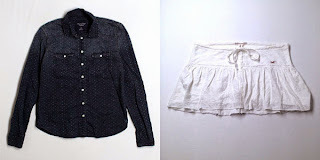 While looking for an easier way to sell my clothes in bulk, I came across online "consignment" stores Twice and thredUP, which follow the same model as Buffalo Exchange, Plato's Closet, etc. wherein you can trade in your clothes for cash or store credit. I sold a batch of clothes to Twice and am still waiting on thredUP, and of course I couldn't resist buying a few things (okay, six things - still about a tenth of what I recently sold/donated) and overall, I'm really happy with the experience. Most of these are items I've been wanting for a while but just never found at the right price. The blazer was a bit of an impulse purchase and isn't as flattering as I'd hoped, so I might be sending that back (luckily, Twice provides free return shipping). Detailed comparison after the cut! I've always loved surprises, so I like the general idea behind beauty subscription boxes, but I honestly don't use a lot of common beauty products (e.g. mascara, blush, perfume, nail polish) and have limited funds, so I've held off on the whole subscription craze until now. 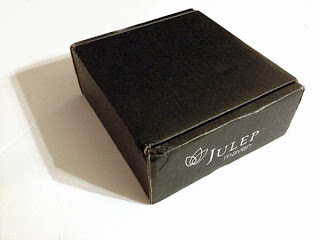 I like the model used by Julep - you're shown all of the possible boxes ahead of time, and you can choose any of the month's boxes, send your box to a friend, or skip the month entirely - but I rarely use nail polish, and usually stick to clear or sheer pink. Julep has five different "style profiles": generally, Boho Glam, Bombshell, and Classic with a Twist all contain one beauty product + two polishes, while Modern Beauty contains two beauty products and It Girl contains three polishes. You're not forced to stick with the same profile month to month, and all the items from the other sets are available as add-on items (up to three) for a discounted price, so there's a lot of flexibility. Since I'm not much of a polish person, I didn't consider subscribing until they introduced the Modern Beauty profile. I came across a "free first box, just pay $3.99 S&H" code (FREEBOX) and figured it was worth the hassle of canceling the subscription later to pick up the Modern Beauty Intro Box, which contains their Glycolic Hand Scrub and Rock Star Hand Creme ($20). Busy doing spring cleaning - getting rid of things I don't need, and organizing the things I'll be bringing for school in the fall. 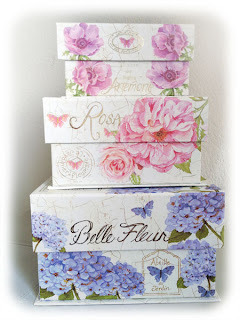 Picked up a matched set of pretty paper boxes at Michael's - usually they're pretty pricey, but this week they were on sale for 40% off, so the total was less than $15 including tax. 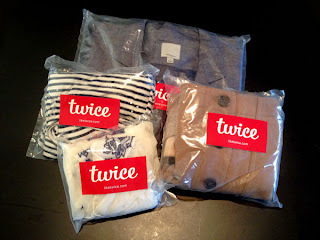 So pretty - like packages under the Christmas tree! Just looking at them makes me happy. Haven't posted in a long time - went through some personal stuff and lost interest in beauty/fashion for a while. I lost some weight over the last year, and while I've generally enjoyed buying new clothes (or finding that old ones now fit again), I still have problems finding dresses and shirts that fit well because my shoulders/chest are a couple of sizes bigger than my waist/hips. I considered having clothes custom-made to fit me, and even signed up for an account on eShakti a while ago, but the dress I had chosen went out of stock and I sort of forgot about it. But back in February they emailed me asking if I'd like a sample dress to try, custom-sizing included, so I picked a dress - and here it is! I picked the contrast trim poplin dress and had it custom-sized to my measurements, as well as shortening it to above-the-knee. Notice 12/2015: I have not purchased from Tokyo Fashion since this was originally written and do not intend to do so in the future. Their website has since changed and I am unfamiliar with current procedures. As such, I am unable to answer email inquiries regarding the ordering process. This post will be left up only as a reference in case it is helpful. Since I wrote my original tutorial on ordering from Tokyo Fashion, their signup and payment processes have changed. I think they're a bit more straightforward now. Tokyo Fashion (東京著衣) is a popular Taiwanese brand founded by Mayuki Zhou in 2005. Along with its sister brands Mayuki and YOCO, Tokyo Fashion is one of the top Taiwanese webstores, and they have consistently good quality. Their styles often get copied by Chinese wholesalers, unfortunately, but if you want the real thing you can buy directly from them - they ship internationally, and the price works out to about the same as a wholesale site anyway. You have to sign up with their system to order, but then you actually order by email. Even though they do have instructions on their site, only the general instructions are in English, and I thought that non-Chinese-speakers might have some difficulty navigating, so I made a quick guide. Warning: image heavy! Click on the images to expand.